24 Hours Blogging!..... : Isaignani Ilaiyaraaja! Ilaiyaraaja(born June 2, 1943 as Gnanadesikan) is an Indian film composer, singer, and lyricist. He has composed over 4,000 songs and provided background music for more than 800 Indian films in various languages in a career spanning 30 years. He is based in Chennai, India. 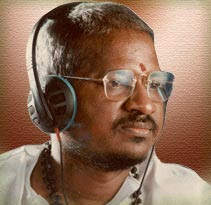 Ilaiyaraaja was the most prominent composer of film music in South Indian cinema during the late 1970s, 1980s and early 1990s. His work integrated Tamil folk lyricism and introduced broader Western musical sensibilities into the South Indian musical mainstream. He has thrice won the Indian National Film Award for best film scoring. He is married to Jeeva, and the couple's two sons (Karthik Raja and Yuvan Shankar Raja) and daughter (Bhavatharini) are film composers and singers. In Chennai, Ilaiyaraaja worked in a band for hire involved in performing music for various stage shows and formal occasions. Ilaiyaraaja also worked as a session guitarist and keyboardist/organist for film music composers and directors such as Salil Chowdhury from West Bengal, who often recorded music in Madras. Ilaiyaraaja has won the Gold Remi Award for Best Music Score jointly with film composer M. S. Viswanathan at the WorldFest-Houston Film Festival for the film Vishwa Thulasi (2005).He was conferred the title Isaignani ('savant of music') in 1988 by Tamil Nadu Chief Minister M. Karunanidhi and received the Kalaimamani Award, an annual award for excellence in the field of arts from the Government of the State of Tamil Nadu, India. He also received State Government Awards from the governments of Kerala (1995), Andhra Pradesh and Madhya Pradesh (The Lata Mangeshkar Award) (1998) for excellence in music.